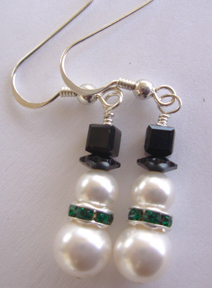 Snowman Earring Kits contain: 2 sets of 2 graduated Swarovski pearls , 1 set ss earring findings, 2 – 6 mm Emerald rondells, 2 – mm Lachrose flower in jet, 2 – 4 mm cubes in jet, 2 ss headpins. 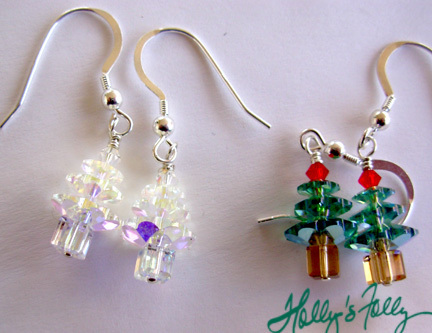 Snowman Pendant kits contain: 1 set of 3 graduated Swarovski pearls , 2 – 6 mm Emerald rondells, 1 – mm Lachrose flower in jet, 1 – 4 mm cubes in jet, 1 ss headpins. 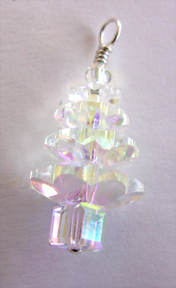 3 Bead Tree pendants (Fit our friction clasp chains, available HERE) contain: 1 ss head pin, 3 graduated Swarovski Lochrose flowers, 1 – 4 mm Swarovski cube, & 1 – 3 mm Swarovski bicone. Available in Ernite AB and Crystal AB & Emerald (not AB). 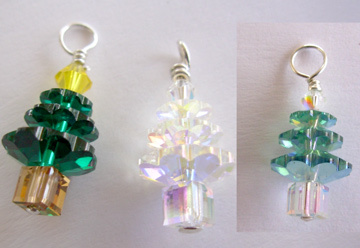 4 Bead Tree pendants (Fit our friction clasp chains, available HERE) contain: 1 ss head pin, 4 graduated Swarovski Lochrose flowers, 1 – 4 mm Swarovski cube, & 1 – 3 mm Swarovski bi-cone. Available in Ernite AB and Crystal AB & Emerald (Largest Lochrose flower is AB). 18″ Choker style necklace – perfect for adding one my lampworked hearts to. Five strands of stainless steel, coated with a plastic for easy cleaning. 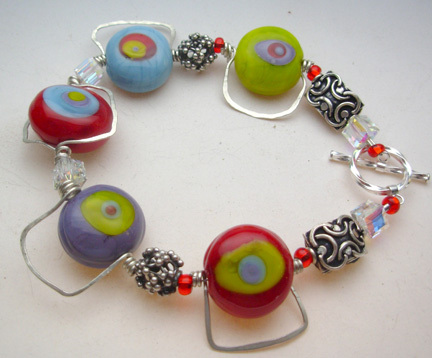 Bracelet inspired by a Kandinsky painting and created for June’s Art Bead Scene contest. 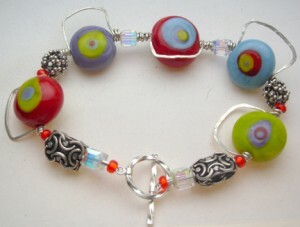 This bracelet was the winner for the month of June! Check out my bead blog for more on that. 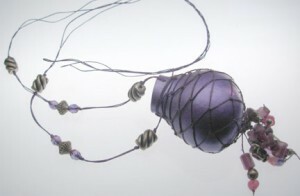 Straight sided lampwork lentils in Blue, Purple, Red and Chartreuse. The bracelet combines hammered silver bead frames, Bali Beads, Silver lined e beads, Swarovski crystals and a sterling toggle clasp. 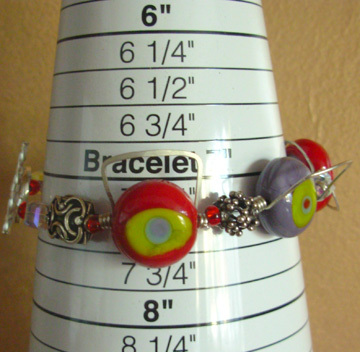 Another Option for ready to wear beads. 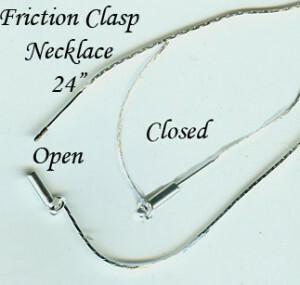 These necklaces feel cool on your neck and look even cooler! 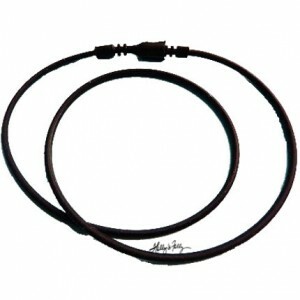 Trendy rubber tubing necklace with a friction clasp. 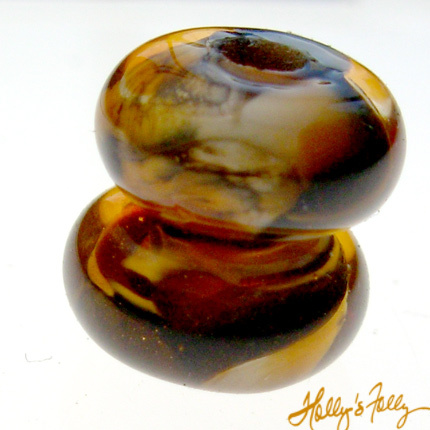 My off mandrel glass hearts look great on these! Each 18 inch x 2mm soft rubber cord comes with its own locking mechanism. 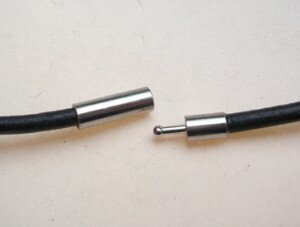 Simply squeeze and insert the plastic tip to lock the cord together. 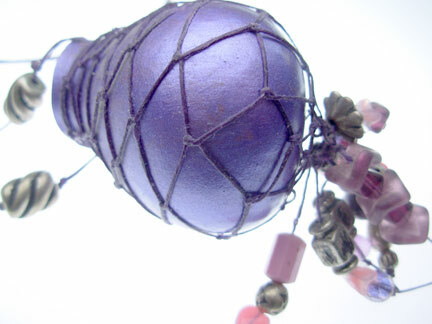 Add a pendant or some beads to give it more charm! 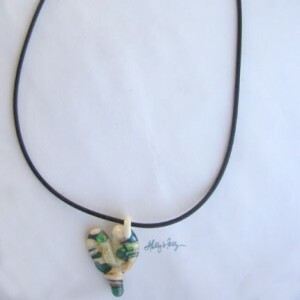 Or wear it by itself to for that super cool surfer look. If you are wondering if one of my hearts fit this cord…just convo me.